Join us for an evening with winners of the AU-Pulitzer Center International Reporting Student Fellowships. Free and open to the public, this event shares with you some of the stunning work done by these journalists in countries like Thailand, Mexico, Borneo, Laos and others. A brief screening will be followed by a panel discussion. FREELANCERS: Between Headlines and Hope is a 90-minute encounter between media creators, disseminators and consumers exploring ways to support and to protect freelance journalists working overseas. 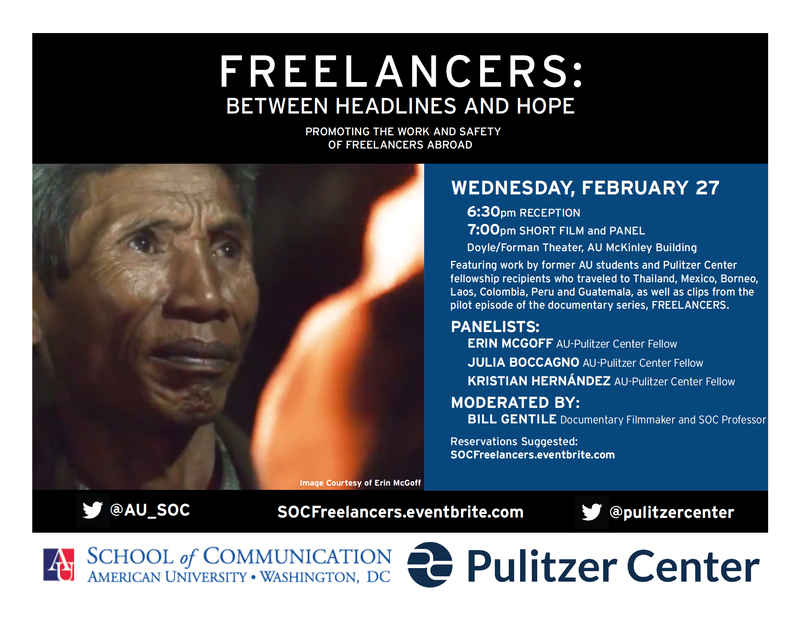 The event features the partnership between the Pulitzer Center on Crisis Reporting and American University’s School of Communication. In recent years, this partnership has supported international reporting fellowships by AU students traveling to Thailand, Mexico, Borneo, Laos, Colombia, Peru and Guatemala. The event is moderated by SOC Professor Bill Gentile. Our encounter begins with a brief video featuring clips from documentary films and other works produced by former AU students. We also share clips shot in Mexico during production of the documentary series, FREELANCERS with Bill Gentile, about the new breed of freelance foreign correspondents filling the void left by mainstream media retreating from news coverage abroad. Some of the student authors of the works will be present to engage with the audience.